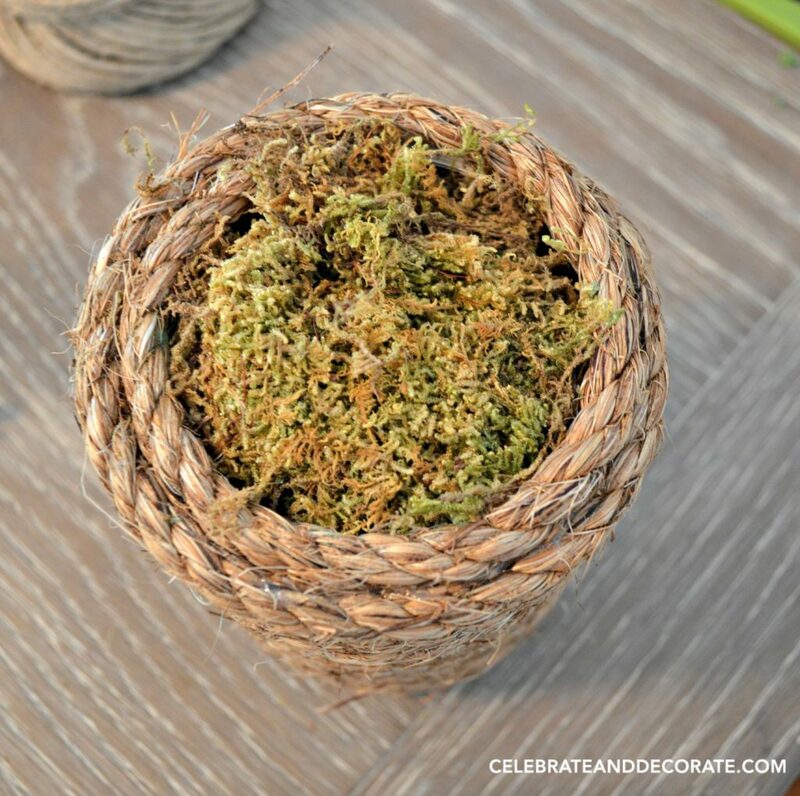 It is time to look toward spring and summer and update my coffee table vignette, so I decided to get crafty and create these easy succulent vases to add some greenery to my interior. 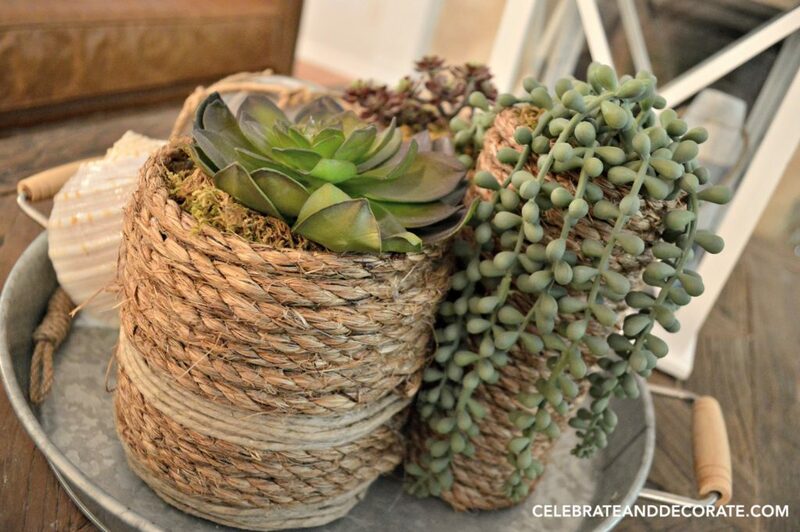 These are faux succulents, so I can’t kill them! 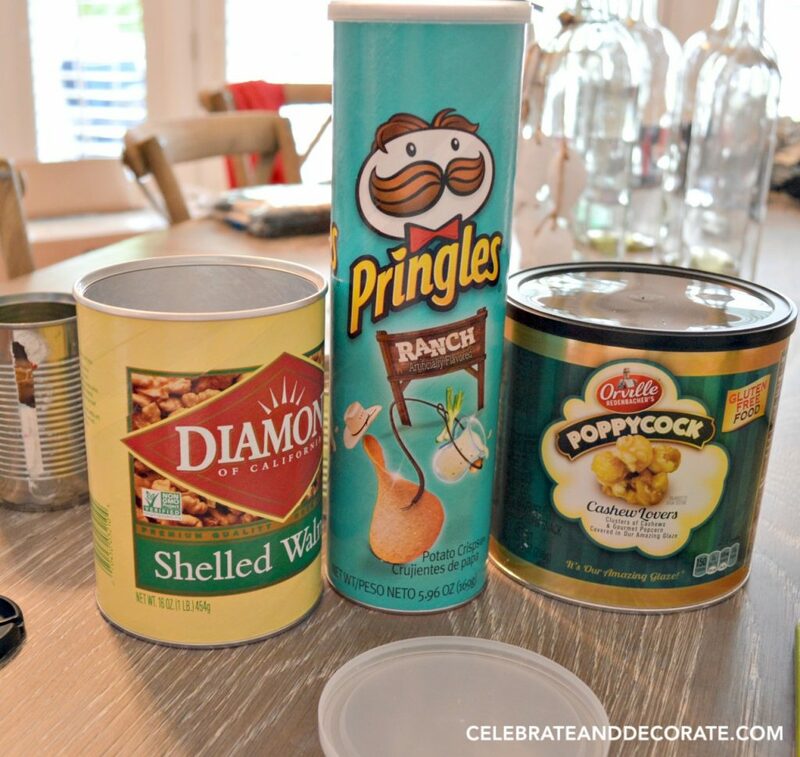 I began with a variety of empty pantry containers. 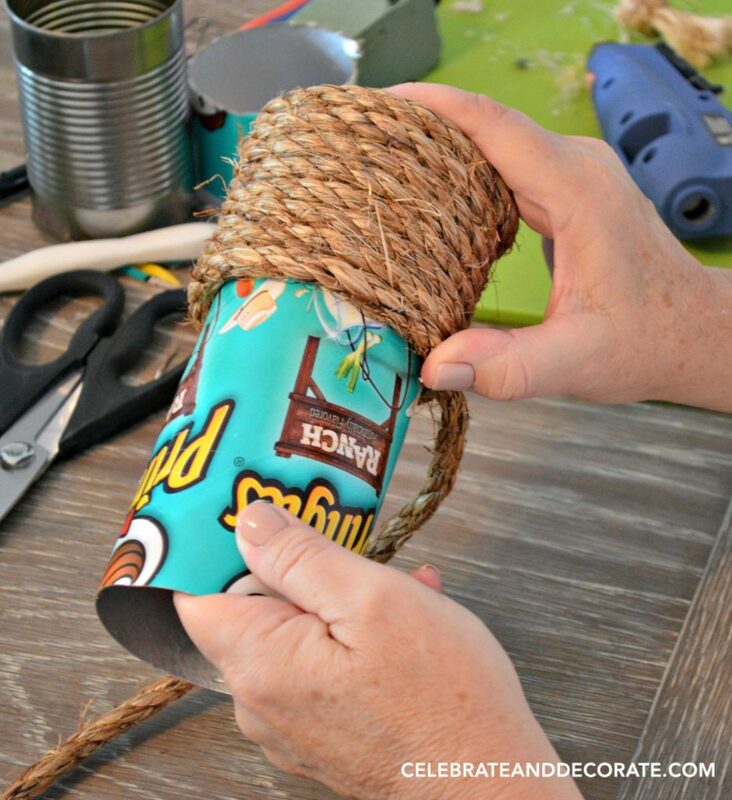 Much like I made my coastal napkin rings, I used hot glue and began wrapping my first container with rope. 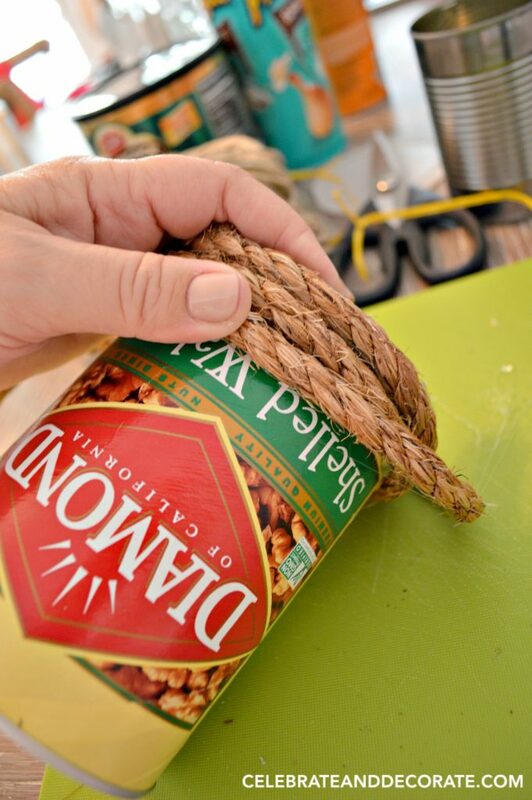 I just kept wrapping and gluing, making sure I squeezed the rope tightly together as I added more rope to the container. When I got to the top, I made sure that I wrapped the rope around to hide the metal rim at the top of the container. The next step was to stick a piece of floral foam down inside the can without having it rise above the top edge of the vase. 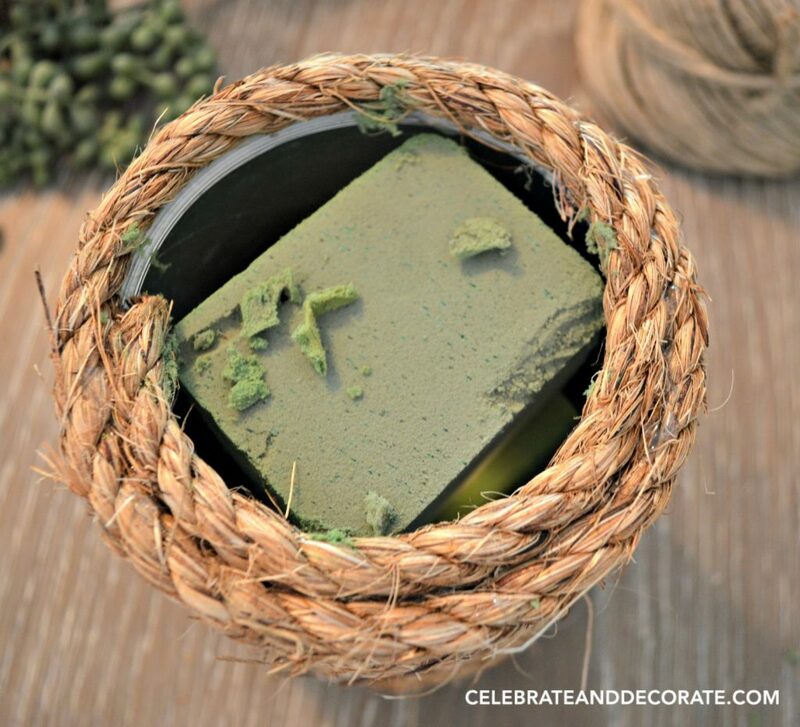 I added moss onto the top of the floral foam, filling the spaces all the way around the edge of the can. I “planted” my little faux succulent and it looked great! Time to start more! For the third vase I decided to mix in some sections of hemp rope with the larger gauge rope for a little interest. 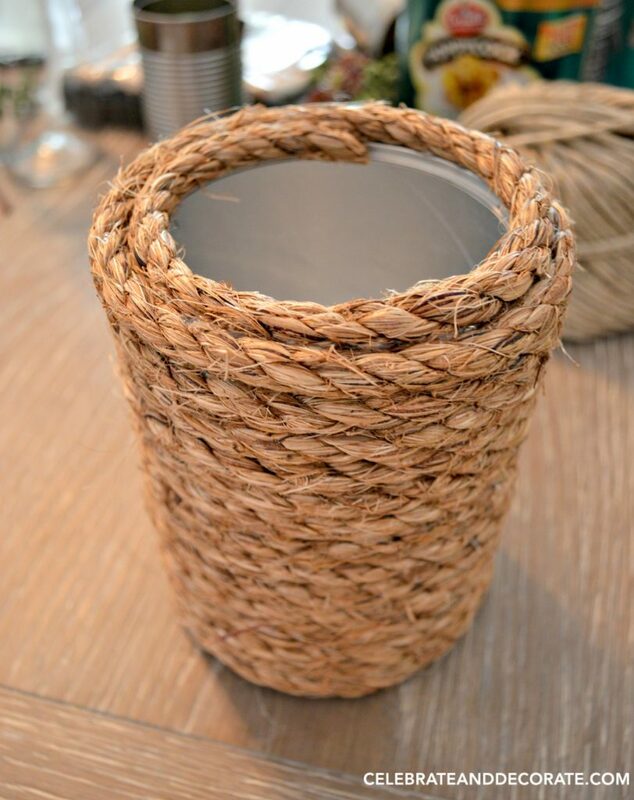 Some empty containers, some rope and a glue gun and glue can create some beautiful vases. You can use these for fresh flowers if you are using cans or other waterproof containers. Chloe, you are so creative! What a cute idea! Thanks for sharing, and I hope that you have a wonderful day!!! Thank you Pam, but I am thinking I need to move onto new craft projects! Really neat and practical idea. Thanks for sharing! Thank you, Karen, I am enjoying them. I knew there was a reason I’ve been saving cans! 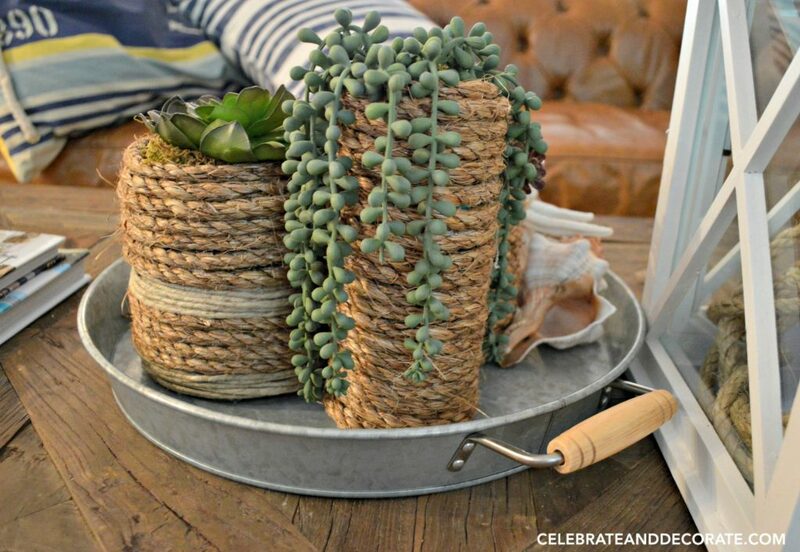 This is such an inexpensive and easy way to update your decor and sneak in a little more. 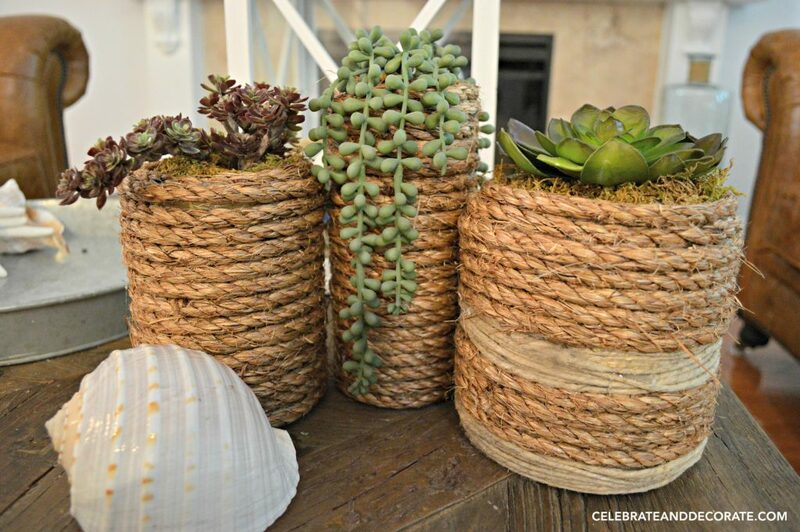 Chloe, will these succulents grow without putting soil in the can . I see you only put foam in and moss. Thank you for your ideas. One idea I might share is to braid some colorful ribbon into the twine. If you try it. I can see what it turns out like and save it in my craft book . No, Sue, these are artificial succulents. 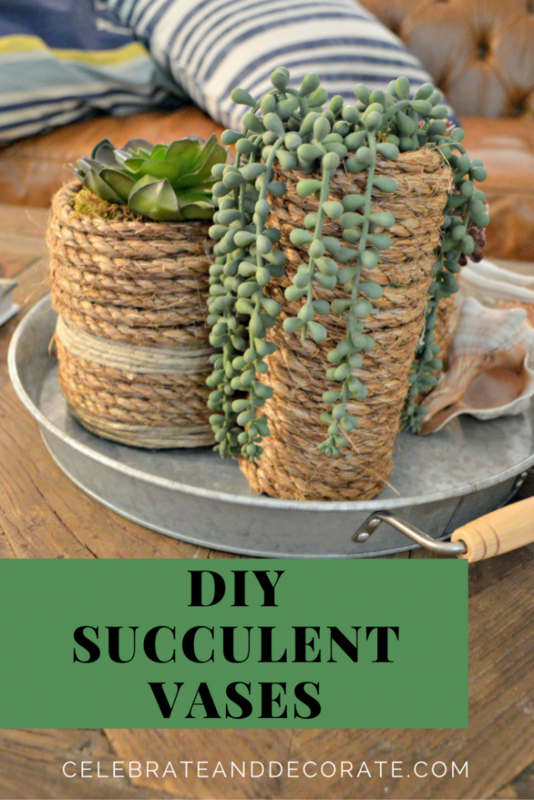 You would need to use dirt for real succulents and cannot use cardboard containers, as the moisture will deteriorate the cardboard. Awesome idea. I like it. 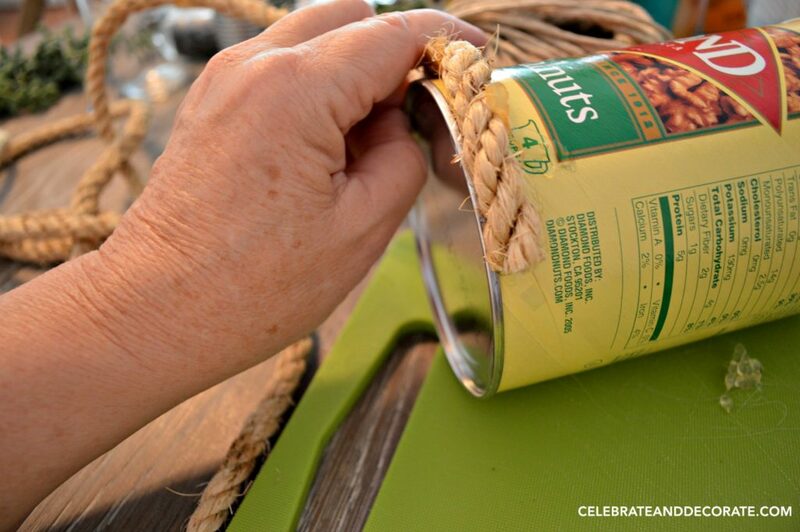 I am going to try this with a spin on the twine. Thank you! Have a good time with that project! This is so cute! 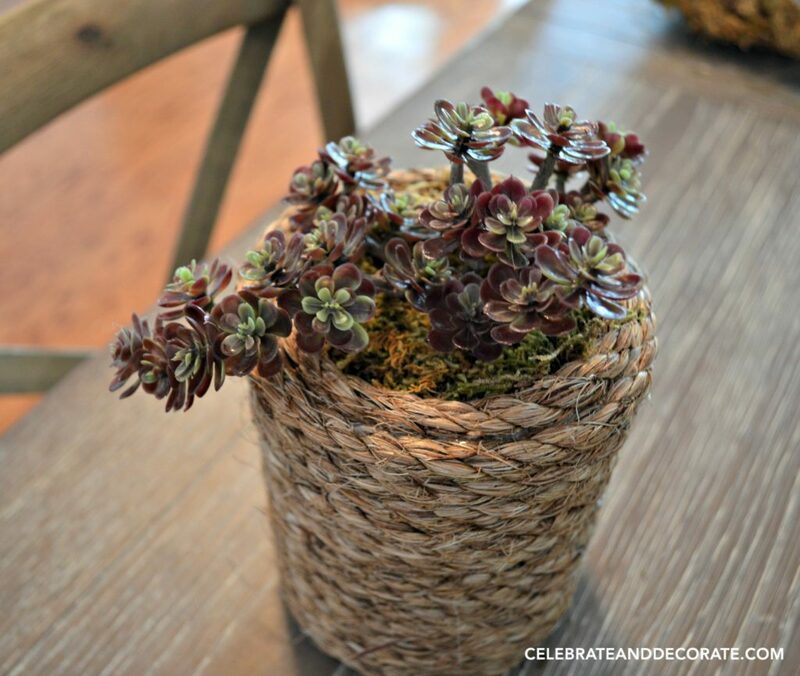 I am not a huge fan of succulents – yet – but these I could look at! Very neat idea, thank you for sharing. Saw this through Hometalk, and now I am going to subscribe to your site! Thank you Andrea, I am not too good at keeping plants alive, so these are a nice alternative and add a little greenery! Thanks for subscribing, I hope you enjoy! They look fantastic! I recently wrapped the lower part of a battery-operated candle with sisal am starting to get hooked on the look. What a great selection of succulents you used. Can you share where you got them? Thank you Pat! I got them at Hobby Lobby! These were artificial plants?! Wow! I thought they were real. I’m not really a greenery type of person either but these look nice AND real, like I said. I love flowers and some plants but I would always joke (but was actually serious) that I could kill a silk plant, lol! I love this idea! 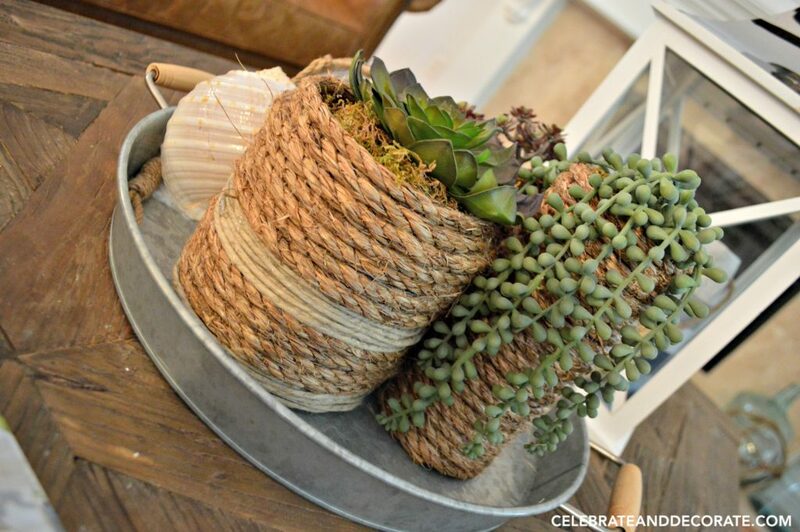 And, I love the different things you can do with this type of rope and twine! It’s like, “Why didn’t I think of that?” Thanks for the idea and I just signed up to get your emails! That looks so easy! I am handicapped and I think I can even do this. Thanks Michaela, as long as you don’t burn your fingers with hot glue, you will be good! These are so cute! This would be a great craft to do with the kids as well! Family time and beautiful decorations for the house…win, win!!! Thanks for sharing!! Thank you Amber! I am glad you enjoyed it! I think they make great Christmas gifts, too! Chloe, you are so clever girl….after I see one of your DIY’s, I say to myself…why didn’t I think of that…too easy and soooooo cute. Chloe, these are terrific – pinned!